There is nothing more comforting than a big bowl of hearty soup! Especially when the weather outside is cool and our hands and souls are in need of some warming up. 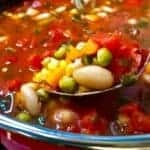 In addition, one of the awesome things about soup is that it’s super easy and inexpensive to make! With young twin boys in the house, I’m all about simple. 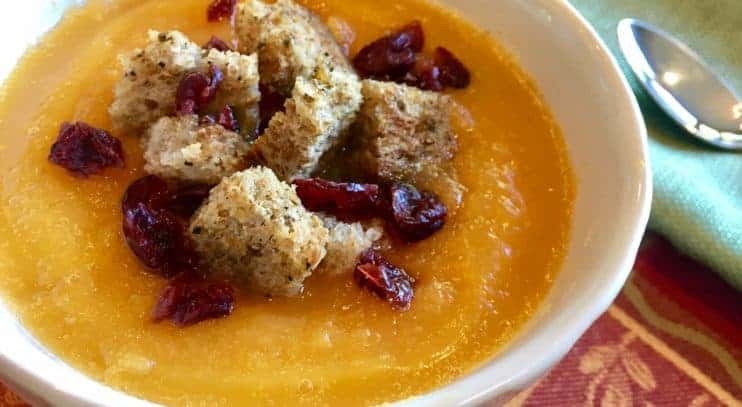 This butternut soup recipe is by far one of my favorites. 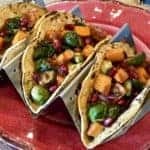 It’s simple AND delicious! 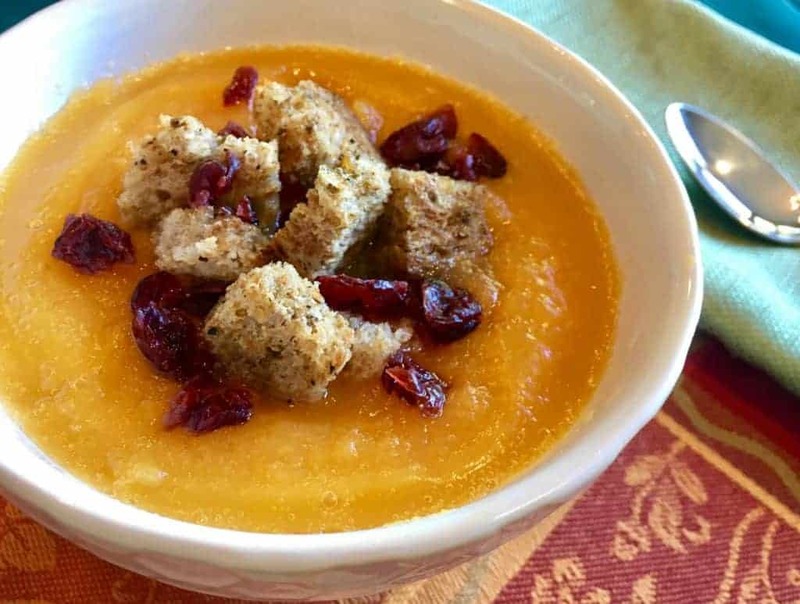 Thanks to the bright orange color and slight sweetness of the squash, the crunch of the savory croutons, and the sweet chewiness of the dark red cranberries, this soup offers a variety of colors, flavors and textures that will have you coming back for seconds – mark my words! 1. 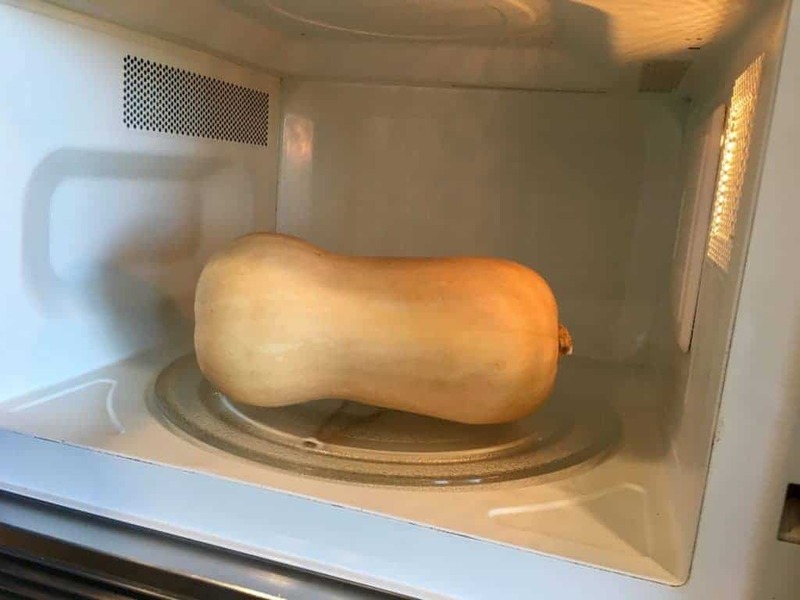 First, make life a little easier for yourself and microwave your squash for 3-4 minutes to soften it before attempting to slice it in half. Meanwhile, pre-heat your oven to 375 degrees. 2. Next, cut off the stem, slice the squash length-wise, and then scoop out the seeds with a spoon. 3. Then, lay your squash flesh side down onto a parchment-lined baking sheet. 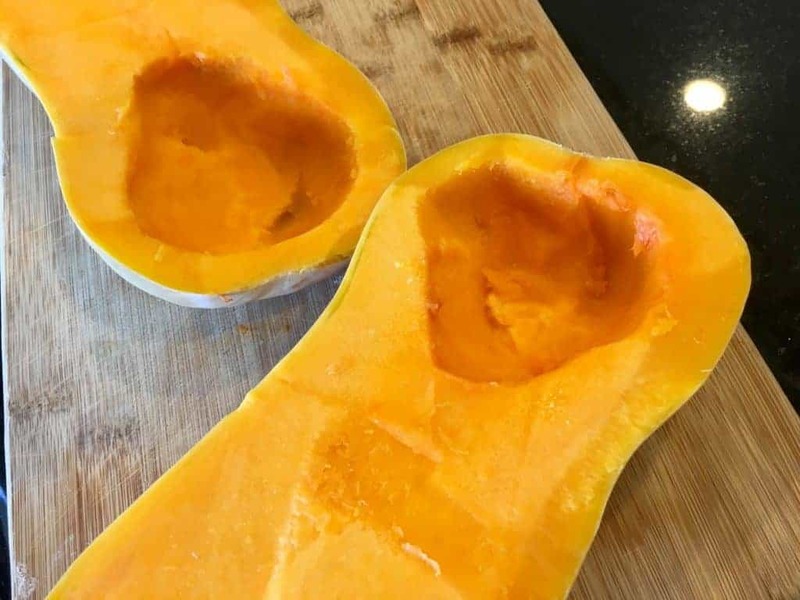 Bake the squash in your pre-heated oven for about 45 minutes or until very fork tender. 4. 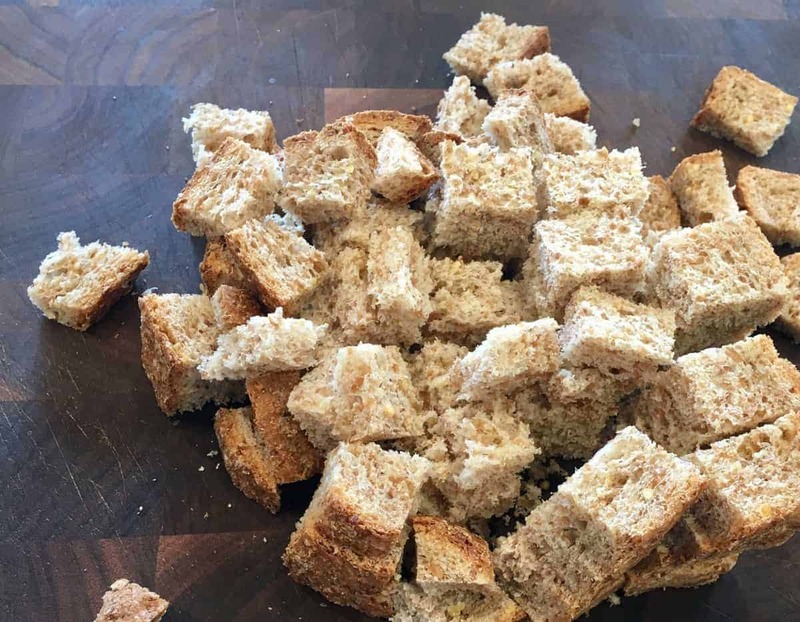 While your squash is baking, make your croutons. 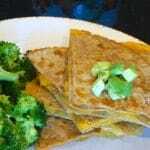 Simply take four slices of any type of bread and chop them into one-inch little squares. Then, spread evenly onto an additional parchment-lined baking sheet. 5. Next, lightly drizzle bread cubes with about 1 T. of olive oil and mix them together with your hands. Then, dust with sage, salt and pepper and mix with your hands, again. 6. 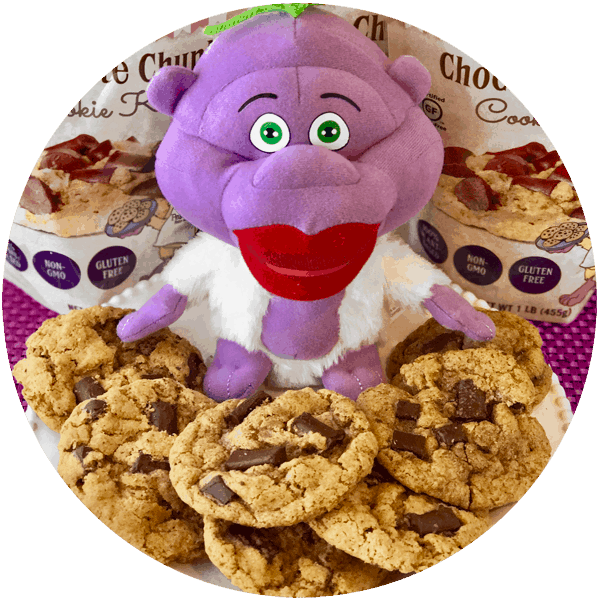 Pop those bad-boys into your 375 degree oven and bake for 10-15 minutes until the edges are browned. 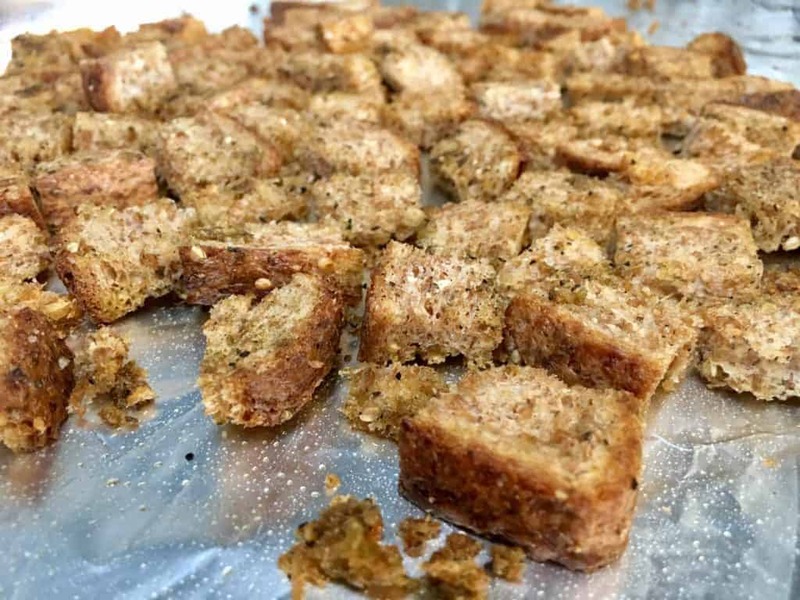 Right away, take a sample; if those croutons aren’t crunchy, put them back in the oven for another couple minutes. Also, check the salt level; if they aren’t salty like a chip, give them an extra dusting. 7. 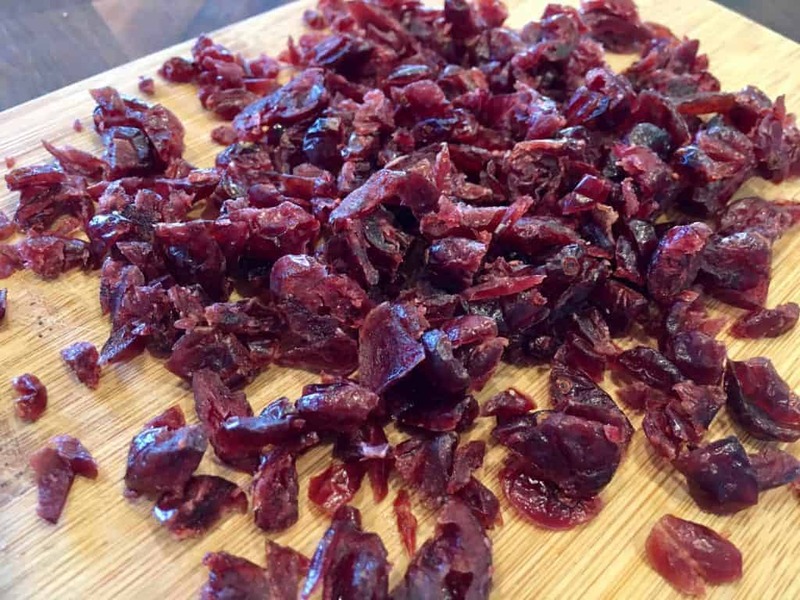 Now would be a good time to prep the dried cranberries. 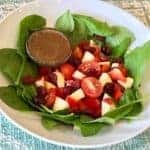 Simply place those berries on a cutting board and give ’em a rough chop! When your squash is done, the skin will be slightly shiny, wrinkly and brown in a couple places. 8. Once cool enough to handle, scoop the cooked squash out and into a bowl. 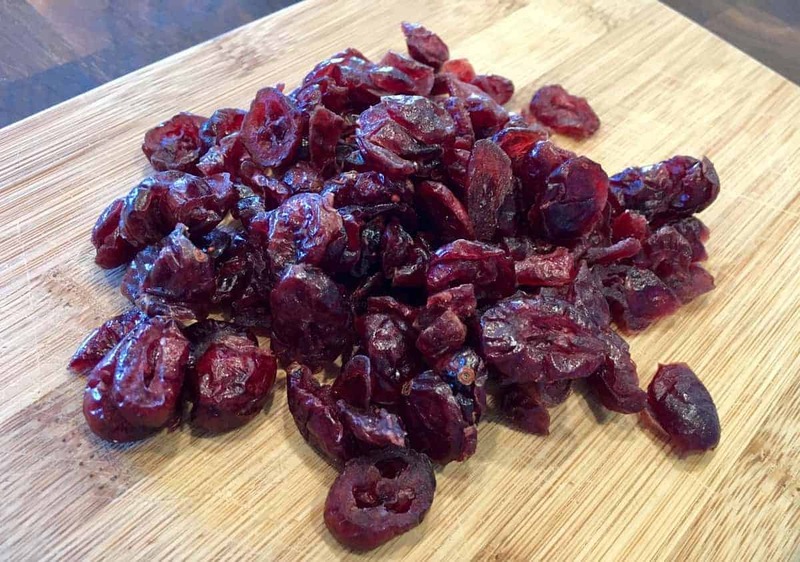 Discard the skins. 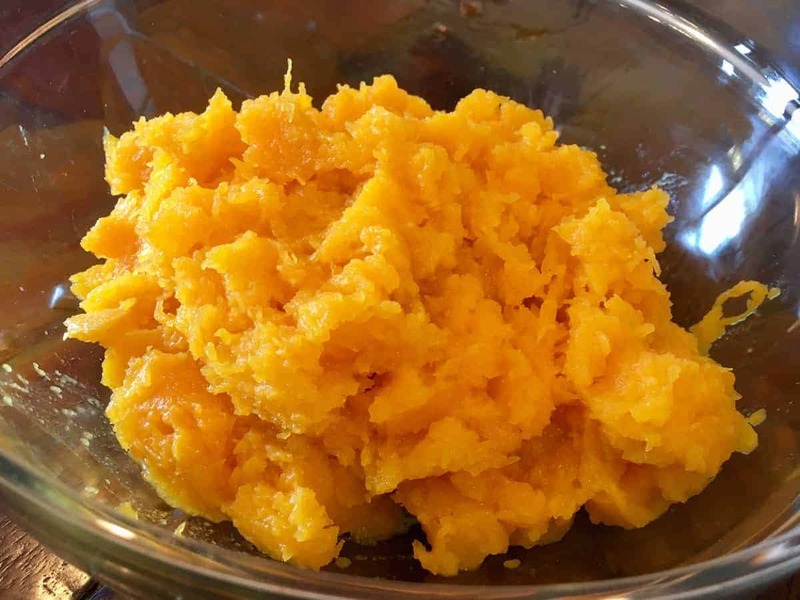 FYI – if you’re in a pinch, you can use frozen butternut squash instead! Simply heat those b-nut squash cubes in the microwave or on the stove, and you’re good to go! 9. 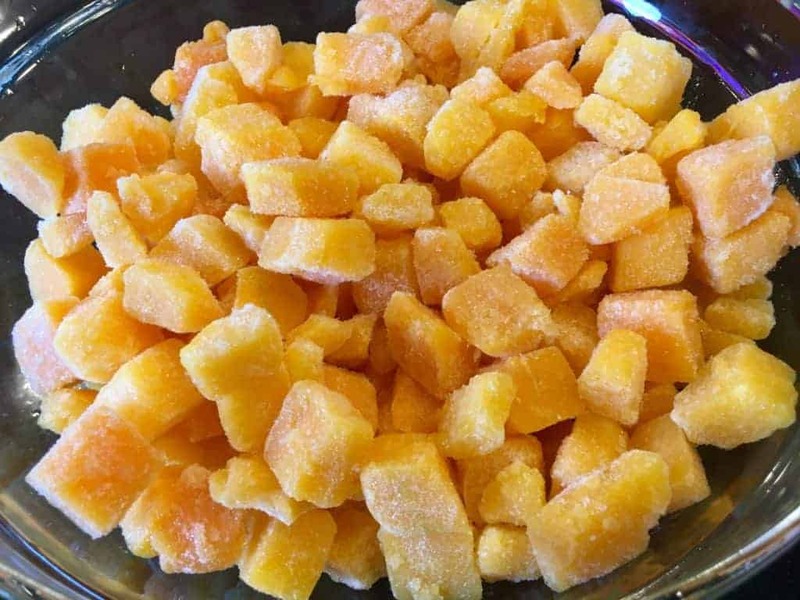 Next, carefully place the vegetable stock, 4 – 4 1/2 cups of cooked squash, salt, onion powder, and maple syrup into a high-speed blender and blend until very smooth. Alternatively, you can place all ingredients into a large pot or dutch oven and puree with a hand-held immersion blender, instead. 10. 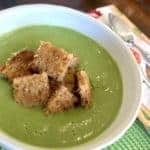 When ready to serve, ladle your smooth soup into a bowl, add a few croutons and a healthy pinch of cranberries to the top, and prepare yourself for some serious comfort food magic! If you have nutmeg on hand, do yourself a big favor and dust the surface of your soup with that, too. It takes it to another level. 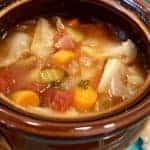 Watch this video to see how I make this soup!